Our Bar Harbor Restaurant, the Looking Glass, is located on the grounds of the Wonder View Inn on Eden Street in Bar Harbor. Access to the Restaurant is also available from Highbrook Road. We offer free and ample parking for the convenience of ourvrestaurant guests. Northbound travelers take I-95 into Maine and continue on I-95 to exit 182A. Follow Route 395 East to Route 1A to Ellsworth. Go straight on Route 3 to Bar Harbor. The Wonder View Inn is about one mile beyond the Acadia National Park entrance and is on the right. Southbound travelers take 1-95 to Exit 182A and follow northbound directions. 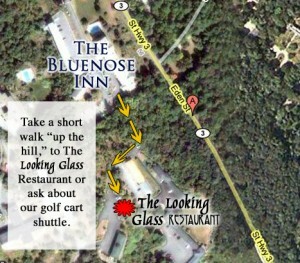 We are located high up on a hill with stunning views of Bar Harbor – away from the hustle and bustle of downtown. Dine inside or on our deck with a fire pit. Pets are allowed on our deck as well.